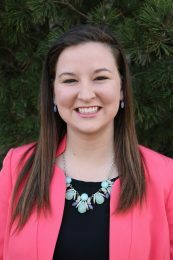 Katie Burke, previously Katie Starzec, is one of the many additions to the Department of Communications and Agricultural Education at Kansas State University. Burke will serve as an instructor for the agricultural communications and journalism program and will begin Monday, September 11. Hannah Fry, junior in AGED, has taken advantage of some great opportunities while in college. Over the 2017 spring break, Fry traveled to Spain to study abroad. 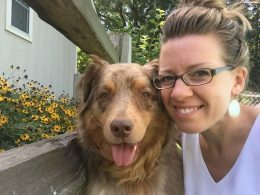 In addition to her primary degree, Fry is minoring in animal science and industry (ASI) and international agriculture, so traveling abroad just made sense. Additionally, Fry speaks Spanish so Spain was an excellent choice. Snowbird, Utah was the host of this year’s Ag Media Summit and was held over the course of five days, July 22-26. 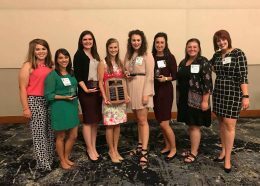 The resort hosted many Agricultural Communicators of Tomorrow (ACT) chapters plus industry professionals and among those were eight of Kansas State University’s very own. Audrey King, ACJ instructor and ACT advisor, and seven students made the trip to Utah and returned with some serious hardware. They were named chapter of the year in the membership, leadership and community service categories. Topping the list of awards was being named this year’s overall outstanding chapter. The agricultural industry faces many challenges every day and constantly. One issue that may be overlooked by some is the shortage of agriculture teachers available. Like every problem, this too has a solution and the agricultural education program at Kansas State University is taking major leaps to bridging this gap. 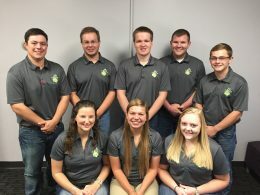 The Teach Ag Students of Kansas program, also known as the TASK Force, is a group of agricultural education students that travel the state of Kansas to recruit future agriculture educators. This group was established in the 2015-2016 school year and is now in its third year. Each May, seven new members are selected, while one student carries over into the next year, making it an even eight-member team. The student serving in their second year is tasked with overseeing the other students and is in charge of campus activities.